The 4th Dawson Daily News Print & Publishing Symposium, and in fact, the entire Yukon Riverside Arts Festival that is was a part of, has come to a conclusion, and all indications are that it was another wildly successful weekend. Special thanks go to the events’s partners, the Dawson City Community Library, and Parks Canada. The Symposium’s Sunday afternoon sessions were again well-attended, as the workshops all attracted participants trying their hand at various of printing techniques, under the expert guidance of Joyce Majeski, John Steins, Mathias MacPhee, and Todd Stewart. The results were often spectacular, especially given it was the first time many of the individuals had worked with the artistic technique in question. The ongoing open-studio projects also all wrapped up as the closing loomed. Jan and Crispin Elsted of Barbarian Press completed the daunting task of hand-printing hundreds of inside pages for The Riverside Reader, an anthology by local writers, which will be assembled and bound in the coming weeks. Emily Davidson‘s Alphabet Soup: Queering A to Z came one step closer to fruition, with three of the planned five folios complete, all typeset and printed by hand. And Jill Stanton was able to attract and collaborate with a stream of co-participants throughout the weekend to finish her hand-crafted comic zines created using the often-surreal Exquisite Corpse Comix process. The final discussion of the symposium, provocatively themed “Is Print Dead?” predictably drew a spirited discussion from the roomful of participants. 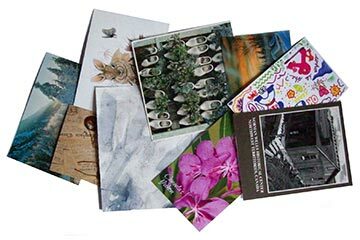 While there were certainly many proponents for the advantages of digital technology, it became clear that printed materials still have their advantages, uses, and certainly a wide-ranging and supportive audience. Chloe Lum and Yannick Desranleau give their artist talk to conclude the 4th Dawson Daily News Print & Publishing Symposium. A special evening session concluded the Symposium. It began with current Berton House Writer-in-Residence Emily Pohl-Weary and Dawson Writer-at-Large Dan Dowhal reading the finalist entries from the Dawson Daily News Postcard Story Competition. The reading culminated with the winning entry by Dawson poet Mary-Alice Fraughton. This was then followed by the main act, an artist talk by Montreal-based artists Yannick Desranleau and Chloe Lum, whose thought-provoking works have been exhibited around the world. 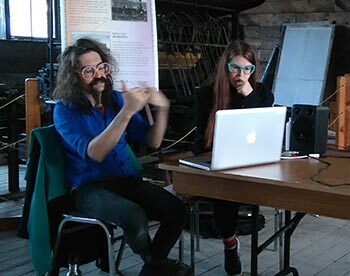 The duo, who also staged a performance-supplemented exhibition in the Oddfellow Ballroom on Saturday night, traced the evolution of some of their collaborative works, and gave some insight into the creative directions they are leaning towards for the future.